"At Home in Hyderabad": It's actually SUNDAY!! Good morning, everybody! With all of these wonderful "church choices"... as expected, caretaker Krishna and I have both decided that it's going to be Mass at St. Mary's in Secunderabad again for this morning. Krishna tells me that he likes the "Jesus pooja" there very much! There will be no loud hymn-singing for me this morning in church, though. You see, after we got back home for a much-needed shower after watching her ride horses for a few hours out at the Polo Club (watching her trot-around the ring on a polo-pony is still a most interesting sight, I must say! )...Amy and I spend a good portion of last night at a Deloitte karaoke party at The Grille Room above Fusion 9 here in Banjara Hills. It seems that I had a bit of a go at Billy Idol's "White Wedding" as my second song choice (and I rocked it, too, don't ya know!?! My other songs were The Who's "Behind Blue Eyes" and Led Zeppelin's "Stairway to Heaven". Sing today?? Sheesh! I'm lucky to be able to talk! Roger Daltrey, Billy Idol and Robert Plant are tough acts to follow!) - and ... well, I sort of blew-out my vocal chords! A Blessed Sunday to all (that would be tomorrow in the USA!). We'll post more about the karaoke party and Suzanne's ride out at the Polo Club early next week! Great post! Wish I could have seen you do Karaoke that night! 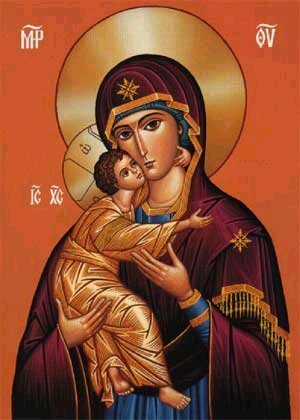 By the way, THAT is an awesome Mary Icon!!! !